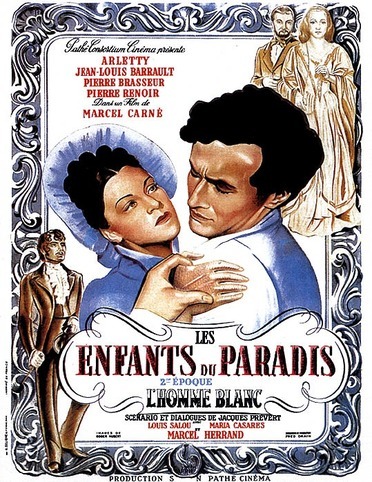 Even in 1945, Marcel Carné's Children of Paradise was regarded as an old-fashioned film. Set in the Parisian theatrical world of the 1840s, Jacques Prévert's screenplay concerns four men in love with the mysterious Garance (Arletty). Each loves Garance in his own fashion, but only the intentions of sensitive mime-actor Deburau (Jean-Louis Barrault) are entirely honorable; as a result, it is he who suffers most, hurdling one obstacle after another in pursuit of an evidently unattainable goal. In the stylized fashion of 19th-century French drama, many grand passions are spent during the film's totally absorbing 195 minutes. Amazingly, the film was produced over a two-year period in virtual secrecy, without the knowledge of the Nazis then occupying France, who would surely have arrested several of the cast and production staff members (including Prévert) for their activities in the Resistance. Children of Paradise has gone on to become one of the great romantic classics of international cinema.